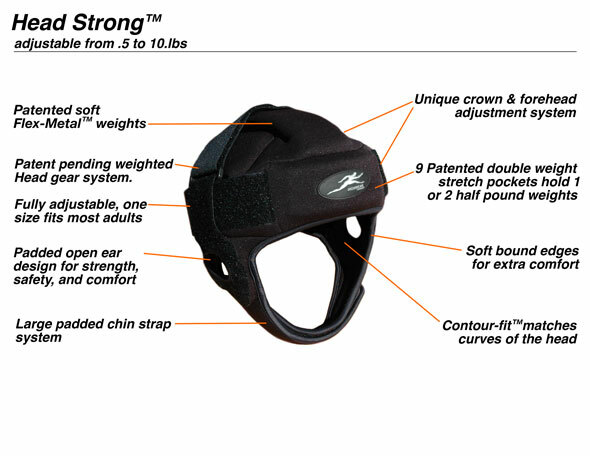 Head Strong™ is IRONWEAR’s ™ new patented adjustable weighted head gear designed for increasing neck strength. Head Strong™ is designed for high durability, simple operation and easy cleaning. Head Strong™ can be used to safely strengthen the users neck muscles. Strong neck muscles are important way to avoid neck injuries. Head Strong™ incorporates all the latest patented IRONWEAR ™ performance features: Ultra thin Contour-fit™ design, soft Flex-metal™ weights, Stretch-fit™inner pockets and Double-lock™ securing system. Head Strong™ Contour-fit™ is ultra thin and snug so that the head gear will not interfere with any movement of the body. The design incorporates stretch padding everywhere for maximum flexibility, support and comfort. Contour-fit™system softly conforms to the contours of the user’s head to uniformly support the weight. Head Strong™ Flex-metal™ weights are the safest, most comfortable and best fitting weights possible. The weights are thin and flexible and contour to the shape of the wearer. The weights act as padding in case of a fall. The weights are interchangeable and can be use in a variety of other IRONWEAR™ products. Head Strong™ Stretch-fit™inner pockets hold the weights securely on all sided and keep them from shifting. The inner pocket design makes in impossible for the weights to come loose while you exercise. Stretch-fit™pockets are thin and flexible. The special weight pocket system distributes the weight uniformly over the head and allows the soft weights to bend and flex with your movements. Because no hardware or Velcro is used to hold the weights in place, the head gear is safer, longer lasting, thinner and more flexible. The inner pockets allow the head gear to be smooth and uniform in thickness. Each inner pocket is designed to hold one or two 1/2 pound Flex-metal™ weights. Head Strong™ Double-lock™ securing system allows the Head Strong™ to adjust to fit a wide range of head sizes. The unique crown and forehead adjustment system allows the Head Strong™ to expand and contact in three dimensions to match the size and shape of the users’s head and features. Head Strong™ securing system incorporates a large overlapping padded chin strap that is both strong and comfortable. The securing system also includes padded ear openings to protect the user’s ears and to allow the user hearing to be unimpaired. All the edges are bound with a soft stretch fabric to provide comfort and protect the user’s skin. 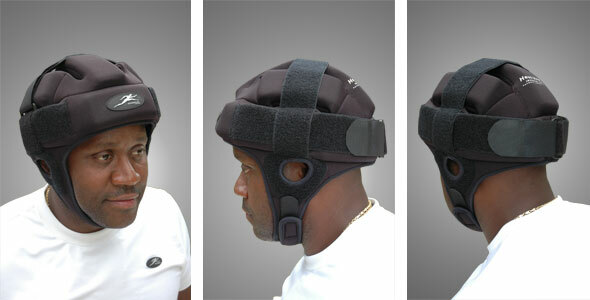 Head Strong™ Open crown design allows air to flow to the top of the users head to help keep the user from over heating. The champion material used on the inside also help to keep the user cooler by wicking the sweat away from the user’s skin and hair. Head Strong™ shell is constructed of a soft woven nylon laminated to a inner rubber layer for maximum durability and easy cleaning. The shell can be wiped clean, or hand washed. The shell can also be machined washed by first removing the weights and then securing all the hook and loop fasteners. The shell dry quickly so it can be air dried. Head Strong™ has 9 weight pockets which into which one or two ½ pound soft Flex-metal™ weights can be inserted. The Head Strong™ comes with one weight per pocket and the shell itself weights just under one pound. The Head Strong™ can be adjusted from 1 (no weights) to almost 10 pounds by double loading all the weight pockets (18 weights). Head Strong™ is a professional tool and should be used under the supervision of a professional trainer, therapist or doctor.